Join the JTown community for a special and unique High Holiday experience combining readings, music, prayers, and opportunities for reflection. The services on Rosh Hashanah, Kol Nidre and Yom Kippur are intended to inspire, uplift, and bring us together as a community. Whatever your level of Jewish knowledge, however you define your spirituality or wish to participate in the service, please join us. Our service will be lay-led by participants who wish to recite a prayer, read a special English portion, play an instrument, etc. INTROVERT ALERT: If you would rather enjoy the services without reading aloud or reciting a prayer, you will not be called upon at any time. We invite your participation in whatever way is most comfortable to you! We are so fortune to have our very talented musician, Jerry Jacobs, with us again this year. His soulful voice and beautiful guitar playing add layers of feeling and inspiration to every service. EAT DESSERT FIRST! Reception/Schmooze at 6:00 p.m.
(All refreshments will be put away by sundown. If you are willing to bring a dessert, please email us HERE. Tickets are FREE for JTowners! or $95 per person/$25 for ages 4-12 for all services. Tickets are limited based on location capacity. If space is available, tickets can be purchased at the door. Please bring a copy of your confirmation email to services. You're Invited to Participate in Leading the Service! 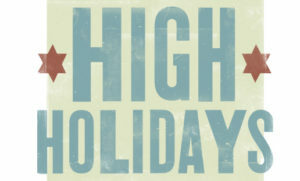 Our lay-led High Holiday Services are designed for involvement of those who wish to participate. If you are interested, please EMAIL US, let us know what your interested in and what services you would like to participate. We will contact you with the information about your participation in plenty of time to prepare. Children and adults of all ages are welcome at our Services. We believe that sharing services with the children in our community is an important component of a positive Jewish experience. To help ensure a meaningful experience for all participants, a special “Wiggle Room” will be available for parents to take their children if they need a break from the service. We also encourage parents to visit the front area of The Hub which has a grassy section, allowing for running and play. First Mitzvah of the Year--Collections for BabiesNow! We will be collecting diapers and baby wipes for BabiesNow! Foundation during all three services. Please consider bringing a box or two of diapers and wipes with you to services. It is a great way to start off the new year. It really does make a difference! Some parents find themselves having to choose between clean diapers and food. On average, a diaper costs $.20 - that's a minimum of $1 per day. $30 will keep a baby clean and dry for a whole month. That's a long time in the life of a little one. BabiesNow! Foundation collaborates with nonprofit organizations and governmental agencies that assist needy mothers/families and their babies. For example, diapers and wipes are given to the moms/babies under the following circumstances: attending parenting classes; participation in baby developmental research sessions; attending drug rehabilitation classes; learning how to take care of a newborn infant; attending GED classes; and taking baby to well-baby checkups and scheduled immunizations. For more information about BabiesNow! CLICK HERE.